In urban areas around the world, traditional music blended with more popular music as well as music from outside cultures. This created entirely new genres, perhaps especially as the phonograph spread in popularity, and perhaps more so when radio became ubiquitous. It’s always been so, and the process is still at work today, despite those who opine that music was “better” or more “pure” at some earlier date. Because of this, the definitions of “traditional,” “folk,” and “popular” are at best just guideposts in a transcultural stew. Kroncong music from what was once the Dutch East Indies in the colonial era, is a particularly enjoyable example of this intercultural mix. Philip Yampolsky, the leading scholar of music of Indonesia, agrees that some elements of kroncong were first brought to the region by black Portuguese sailors as early as the 16th century. One of these elements was the small cavaquinho, which locally became known as the kroncong. The term kroncong eventually expanded to refer to an entire genre of music. The Portuguese influence was just one piece of the puzzle. The region was already mixed in terms of ethnicity. In the late 1800s, a type of theatre known as stambul was becoming extremely popular in both the Dutch East Indies and the Straits Settlements. Stambul theatre, or komedi stambul, was a kind of multi-ethnic popular entertainment featuring versions of stories from the East like Ali Baba, accompanied by music and songs. The performances could last hours. In the 1890s, kroncong songs and performers became part of stambul theatre, and conversely, kroncong performances contained stambul songs. The genre developed over the next several decades until it solidified in the mid-1920s as a professional, popular music. Two of kroncong’s most important elements were the fluid, somewhat improvisatory violin playing, as well as a “walking guitar.” These, along with small lutes strumming alternately in the background and its relatively stable chord structure, gave kroncong a languid, almost Polynesian feel. Primarily, it was a vocal music, though here we have a piece that is solely instrumental, and a chance for the violinist to show off. Both “Achmat” and “Achmad” are common names in Indonesia and this makes identification difficult, along with the fact that many performers from the region, both male and especially female, were only credited on records with their first names. We do know that our Achmat was from Bandung in western Java, and that he’s accompanied here by the Gadjah string orchestra of the city of Semarang. It’s likely this was a “house band” for Odeon records in the mid-1930s. Several years later, in 1938, our Achmat is documented as playing with the HMV label’s house band, but this is as about as much as we know for now. Kroncong was recorded as early as May 1903, when the Gramophone Company first made one-sided discs in Singapore. It continued being recorded by multinational recording labels including the German labels Beka and Odeon. World War I shut down recording in the region for 10 years. 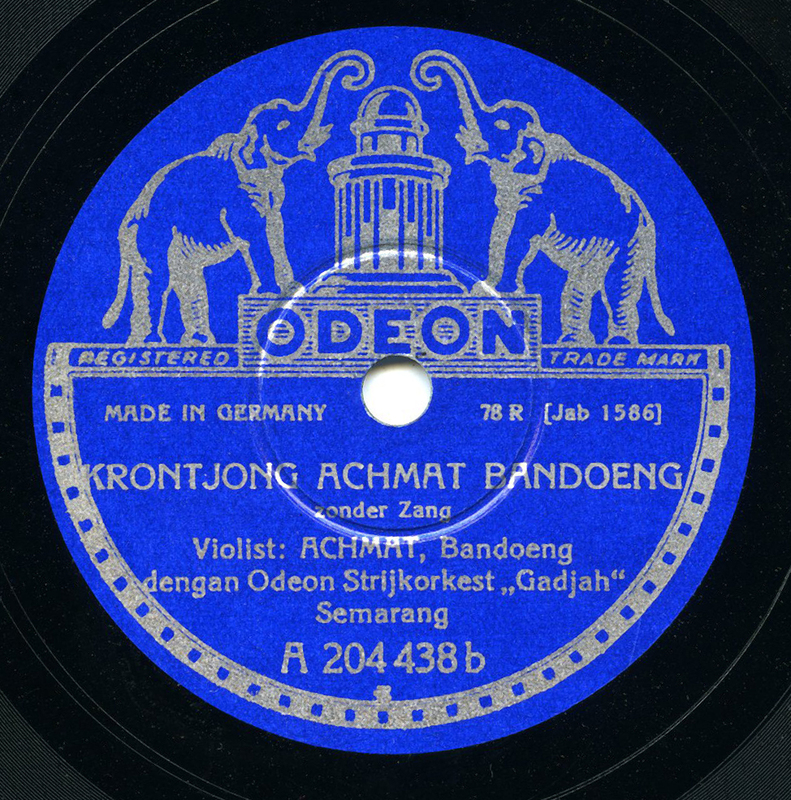 When the labels scampered back to record, kroncong was even more entrenched, with a new, easy-going tempo, and hundreds if not thousands of individual kroncong records were issued prior to World War II, the Japanese occupation, and Indonesia’s independence (and then many more after that). Big thanks to Philip Yampolsky and Alfred Ticoalu. This sounds like a full album in one musical piece. Truly special. Glad you liked it, Samuli! Thanks for stopping by, as always. what a thought provoking introduction, and I do believe you’re correct; it is all too easy to look backwards and believe that everything was better or more pure. Yet to say that we are better than what was, is just horrible, so one can only conclude, that each generation has it’s own burden and joy! I must add that your “Opika Pende” on Dust-to-Digital is a most wonderful guide to Africa! Simply delicious Jon! A totally different use of cavaquinho/kroncong from other musics, and what an unusually and delightfully busy bass player! Not to speak of the amazing sound of the violin, and everything else! The Odeon guys really knew what they were doing! I agree completely, Tony – glad you liked it! “zonder zang” “without vocal(s)” What a lovely music! So good. Jaw dropped. Thank you. Awesome to see Philip Yampolsky’s name here. You may enjoy my site Aural Archipelago, focused on field recordings I’ve collected around the Indonesian archipelago for the past few years. Thanks a lot for the kind words. I probably should have started uploading on YouTube a long time ago, but I’ve been ambivalent about that because a) I want people to experience the entirety of the website and read the content on it, as the music is only part of the experience, b) people upload my transfers to YouTube all the time without permission, including the text without crediting it or linking back to the site, and c) people also take my Excavated Shellac transfers, create downloadable “compilations,” (which is fine, actually), claim copyright on mine and others’ transfers (not OK), and then re-upload them to YouTube, Spotify and Amazon, and earn advertising money on that (really kind of crappy). So, as much as I should be using YouTube as go-to spot, I almost prefer the old-fashioned experience of musical serendipity coupled with the text on an old-fashioned website. I know, I know, it truly doesn’t make much sense. Sir – since you love digging up rare EPs/78s, thought you might appreciate this.